At the start of 2010, San Francisco Bay Guardian editor Johnny Ray Huston and I planned to have a small one year anniversary “celebration” of the Call It Afrosurreal issue by shining a spotlight on Robin D.G. 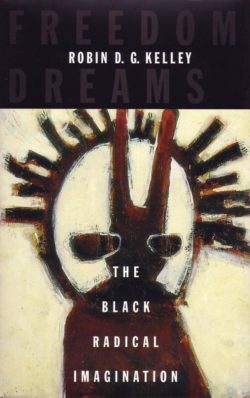 Kelley’s seminal Black Surrealist anthology Black, Brown and Beige: Writings and Images from Africa and the African Diaspora which also came out in 2009. What was planned was a “long” review of the book accompanied by a “longer” interview with Professor Kelley as an insert. At the beginning of 2010, this seemed like an easy and manageable project. Five months later, not so much. Even after winning $15.9 million from the corporate giant Village Voice Media in 2008, and after an injunction was issued against SF Weekly prohibiting them from selling advertisements below cost, The San Francisco Bay Guardian was on wobbly legs. Due to a cut in pages and article length, our project never came to fruition. By 2012, the paper had been acquired, changing its face and focus, and by 2014 they stopped the presses forever. Though I was able to find a place to publish my review of the book, Professor Kelley’s words and insights have been buried in the struggles for space and time. Many thanks to SFMOMA’s Open Space for helping me change that. According to Wikipedia, Robin Davis Gibran Kelley is the Gary B. Nash Professor of American History at UCLA. From 2006 to 2011, he was Professor of American Studies and Ethnicity at the University of Southern California and from 2003 to 2006 he was the William B. Ransford Professor of Cultural and Historical Studies at Columbia University. From 1994 to 2003, he was a professor of history and Africana Studies at New York University (NYU) as well the chairman of NYU’s history department from 2002 to 2003. During the academic year 2009–10, Kelley held the Harmsworth Chair of American History at Oxford University, the first African-American historian to do so since the chair was established in 1922. He was awarded the Guggenheim Fellowship in 2014. 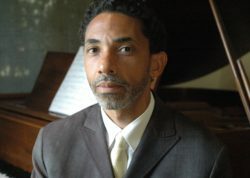 His research has explored the history of social movements in the U.S., the African Diaspora, and Africa; black intellectuals; music; visual culture; contemporary urban studies; historiography and historical theory; poverty studies and ethnography; colonialism/imperialism; organized labor; constructions of race; Surrealism, Marxism, nationalism, among other things. His essays have appeared in a wide variety of professional journals as well as general publications, including the Journal of American History, American Historical Review, Black Music Research Journal, African Studies Review, New York Times (Arts and Leisure), New York Times Magazine, The Crisis, The Nation, The Voice Literary Supplement, Utne Reader, New Labor Forum, Counterpunch, to name a few. He is the author of several books, including Freedom Dreams: The Black Radical Imagination (Boston: Beacon Press, 2002), Race Rebels: Culture, Politics, and the Black Working Class (New York: The Free Press, 1994), Thelonious Monk: The Life and Times of an American Original (New York: The Free Press, 2009), and Surrealism – Black, Brown and Beige: Writings and Images from Africa and the African Diaspora Co-edited with Franklin Rosemont (Austin: University of Texas Press, 2009). D. Scot Miller: How did you first develop an interest in Surrealism? Robin D.G. Kelley: I had never read anything on Surrealism. Of course, I’d read Césaire in college, but reading him as a Marxist. I read Senghor. I knew about Negritude, but I didn’t know how Surrealism related to any of these things. I didn’t know who Franklin Rosemont was. He came to The University of Michigan to give a talk and I really enjoyed it, and I talked to him. Then Jayne Cortez came and gave a reading, completely unrelated, I didn’t know their relationship to one another. I was like, this is amazing, there must be something going on here that I might have missed. I got Franklin’s book, What Is Surrealism? on André Breton and Franklin and I had pretty substantial correspondence. I just realized, much to my chagrin, that he had included an excerpt of a letter I wrote him in the Black, Brown and Beige. If I would have known that, I wouldn’t have included it! I don’t read my own work, I read the work of others. I think that this substantial correspondence could and should be published. He mentored me in so many ways. He’d send me these packages full of books and articles with such care. He schooled me. My archives are ninety percent things that he sent me. They had no money, but he made sure I had all this stuff. The final level of this, the biggest event, was meeting Ted Joans. 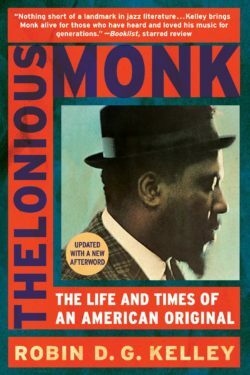 So I took him out to an Indian restaurant, and got to know him and his wife through our conversations about Thelonious Monk. Through that initial encounter, we corresponded and he sent me some great, long letters. By the way, I have some great letters. Amazing stuff has come my way over the years. From that correspondence, we became Ted and his wife Laura [Corsiglia]’s second home. Whenever they were in New York, they’d come to stay with us. I think because the people who they’d usually stay with in New York had had enough. Which was true, I needed to read a lot more and I did read more over time. That was a very exciting moment for me and I was exuberant about it. Between that, Ted Joans that set me on the path to attempt to bring Surrealism into my own politics. It wasn’t aesthetic as much as it was politics. Miller: You say you approached Surrealism as a Marxist and you saw a natural overlap? Miller: You also make a distinction between a certain kind of “new age” mentality and The Marvelous. Can you go further into that? Kelley: It’s funny, because I see it in the way that you make the distinction with Afrofuturism and Afrosurreal Expressionism, which I love by the way. My best friends are Afrofuturist, it’s nothing against them, but the idea that Surrealism is committed to the real, to the now, and to action. It’s not a series of games. Games are a part of life. It’s not about a turning-in, and dreaming disconnected. Nor is it the “new age” search for spiritual ground of the self. To me, Identity Politics has turned away from struggle to the discovery of the self. Which is very important, but sometimes discovery of the self is produced in struggle, collective struggle for change. That’s where I think Surrealism really breaks with a “new age” process of self-discovery. It’s not exclusively about transformation. It’s about revolution, and the only distinction is that it recognizes that no revolution material overthrows state economic incentive. Even Anarchism has a decentralization of economy and politics. And none of that can truly proceed without a revolution of the mind. A revolution in thinking. A feeling of being able to see every single plane of life as its lived, and that those planes are both Surreal, the dream-state, and the landscape of the other side of Earth. We can’t even think globally without imagining the life that we can’t see. That’s fundamental. The distinction is really one of struggle. One of being part of society and another of being a part of society in motion. Miller: In Surrealism And The Creation Of A Desirable Future you write, “The dark side of Surrealism that is more often than not the purview of Black Surrealists who understand that emancipation begins by knowing the mind and understanding what Black Existentialism does to the psyche.” In connection to the struggle and The Marvelous, could you extrapolate on this “dark side”? That song had a big impact on me on being able to articulate around trying to find the sunshine. Part of what makes that song so brilliant is to talk about the cloud. I feel like I erred in my quest for The Marvelous , and what my archaeology did was open up for me reading of Henry Dumas, and Adrienne Kennedy, one of the most brilliant playwrights that have lived period. What Surrealism was to her was a way to describe the psychic and physical and material pain of white supremacy and sexism and violence and colonialism. That “madness” was in some way an expression of that darkness rather than an expression of possibility. I think both are true. I just didn’t really come to terms with it because now I realize that it is in those expressions of being able to talk about the Surreal character of Black life. Looking at Ralph Ellison’s Invisible Man, you’re right about the Rhinehart character, that so much of what makes Surrealism so appealing to Black writers was being able to find the language to experience and express the absurdity of being Black. It’s absurd. I think of Ishmael Reed, his brilliant humor and his ability to turn things upside-down and inside-out, but he’s also saying, if you step back and look at the absurdity of, say, Jim Crow and the amount of resources that go into White people giving up what could be really good life for the crumbs given to them from White Supremacy: The absurdity of that. There was a law where Black people couldn’t have canes, unless they were white canes, and they were blind. They couldn’t own dogs for awhile, during the Black Codes. And the clearly obvious absurdity of being property. 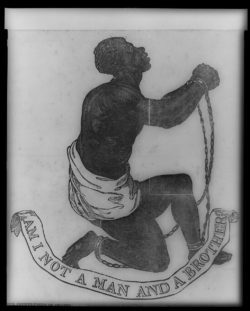 To this day, I go to the radio to talk with the populus, and Black people too, start saying that we don’t need to talk about that “slavery stuff.” It’s in the past. We haven’t even to come to terms with what it has meant to be the body and soul of the Modern era. When you have ledgers, when you have centralized banks, when you have advanced technology that move people across the Atlantic Ocean. And they’re still property as human beings. It’s that absurdity that is still with us today. Globalization begins there. When you think of the factory, the modern factory begins on the sugar plantation. That’s where socialization of labor is taking place. Forms of mass media, global mass media begins, I would argue, with the abolitionist movement trying to use images of slavery and turn them around as moral weapons against the system. How they had mass manufacturing of the (Josiah) Wedgwood symbol, all these different things around the globe. Globalization begins with the buying and selling of human beings. Miller: Black, Brown and Beige is a brilliant anthology that covers the globe and massive spans of time. Why do you think that there has been so little response to the book? Here you are watching Western Civilization. It emerges as Modern as can be, but is the best example of Barbarism you’ve ever seen. You speak the best French, you read the books, and are enjoying all the benefits of Modernity, but you’re looking all around you and realize that these people, the people who look like you, are the truly Barbaric. The victims of that Barbarism are the people of Morocco, the people of Nigeria, the people of Namibia. The modern tools of oppression, repression and violence are being directed at those other folks. But some of these folks are not Barbaric. They have more knowledge of the flora and fauna of their island than scientists have. These people don’t seem to be fighting wars all the time. They invented agriculture. Call it romantic, but that observation turned the world upside down. That kind of romantic celebration was because these people were able to retain something of a semblance of culture, community and psychological balance that the West had lost to Modernity. The problem is that that same Modernity was created together in the same place and time and that’s an error in analysis, an error in understanding scope, but as a political gesture it was a tool that was available to them at that time and a place to beat back against Western Civilization. 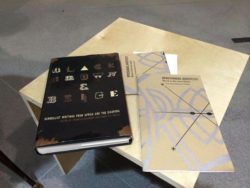 Miller: Based on the incredible geographic scope of the book, covering Invisible Surrealists from Martinique to Egypt and Cuba, we discussed creating an Afrosurreal Cartography in the past. This got me to thinking of Afrosurreal American cities. Chicago, of course comes to mind first, but, San Francisco, with Bob Kaufman, Ishmael Reed, and both Ted Joans and Amiri Baraka calling the city their second home for a time — would you consider San Francisco an Afrosurreal city? Kelly: To me San Francisco was, in terms of visual arts and literary culture, the West Coast Bohemia of the twentieth century. I believe that Bob Kaufman chose to live there for a reason. Just like Charles Mingus. Mingus was an LA person, but he spent a great deal of time in San Francisco. I think of San Francisco as an extension of places like Carmel, Big Sur, and those places where the Beat generation tried to find solace. On the other hand, it’s an extension on the absurdity of Black life. As you wrote in The Afrosurreal Manifesto, it’s a city in which — though we have a Lawrence Ferlinghetti — Black people are dying there. The racial inequality is tremendous and simply gets written off of the face of the Earth because San Francisco is the gay Mecca, it is the place of Liberalism, and Black people are dying, Latinos are dying, there’s ghettos. To me, a Black Surrealist city is any city that experiences Black absurdity. Miller: Which means all of them. This is a conversation I would pay to see in person. Thanks for getting this into print. Worth the wait. Well done D. Scot! I’m such an ignoramus, I had heard of Dr. Kelley but hadn’t read any of his work and your lively conversation with him is such a turn-on. Love the comment about how Ted Joans would stay at his place in later years and the people who previously had lodged him were relieved 🙂 Kelley also makes the remark something to the effect that you wouldn’t guess it but Baraka could always be open, patient and fair, and that was my experience of him and I know yours too? Glad you preserved this valuable record of your talk–you know, it’s even more relevant now, you think?